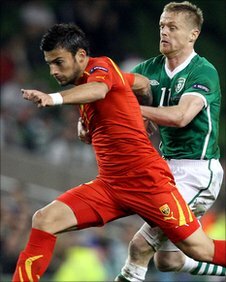 Republic of Ireland winger Damien Duff was delighted and relieved after beating Macedonia 2-1 in the Euro 2012 qualifier at the Aviva Stadium. He said: "I was cramping after an hour, showing what a shift we had to put in. "There's no easy games in Europe anymore. Macedonia put up a great fight but it's a massive three points. "We believe we can do it. We went close to the last World Cup and we're going to put in a big effort to get to Ukraine and Poland." The result leaves the Republic level on points at the top of Group B with Slovakia and Russia, who were held to a 0-0 draw in Armenia. Duff added: "We knew the Russia result coming in so that gave us a little lift. "We have to make this (Aviva Stadium) a fortress like Lansdowne Road used to be and this result goes a long way to that." Republic keeper Keiren Westwood kept the score at 2-1 thanks to a fine save to deny Ivan Trickovski with 15 minutes. Westwood, who was making his competitive debut and deputising for the injured Shay Given, said it was a "massive" result. "We've got a lot of key players out but we worked hard and I thought we deserved it," he added. "I'm just happy to be involved. Sometimes you don't really want to touch the ball but I was delighted to make the save and happy to have contributed. "Shay's been great to me since day one. I was only 23 when I got into the squad and he's been brilliant for me. He's dominated this position and he's a legend."